Grant writing is a highly specialized form of sales communication. Complete your grant writer profile here. Start early. Organize your thoughts to define the project. Leave enough time to edit the application and increase your odds of success. Deadline stress does not produce top-quality work. Get a second pair of eyes. Or even better, a third or a fourth pair of eyes. Outside perspectives can provide critiques of style, presentation, and clear up confusion within the document. Research the foundation. Understanding the funding source's mission, preferences and who they recently funded will help you speak their language. Network. Find someone who knows someone, who knows someone else, who can mention your organization’s name to the Board. Of course, the fewer degrees of separation, the better. Invite the individual to see your program first hand. Do not ever do this wirh a government fundied grant that prohibits lobbying! Include your staff in the process. Your staff should be able to contibute to the content with current up-to-date information, recent testimonials, and most likely have some budgetary and programmatic suggestions. 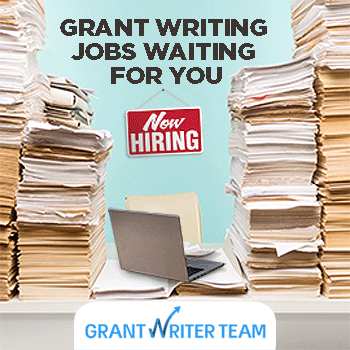 If you are a skilled grant writer, consider joining GrantWriterTeam.com and bid for professional grant writing jobs. Last year 135 jobs were placed and there have been many successes! About the Author: Libby Hikind is the founder and CEO of GrantWriterTeam.com She has matched many skilled grant writers with happy clients.